Nearly 50,000 people participate in the annual Halloween Parade, including costumed marchers, puppeteers, bands and more. Anyone who is interested in participating in the Halloween Parade can—just arrive at Sixth Avenue and Canal Street from the south or the east (i.e. 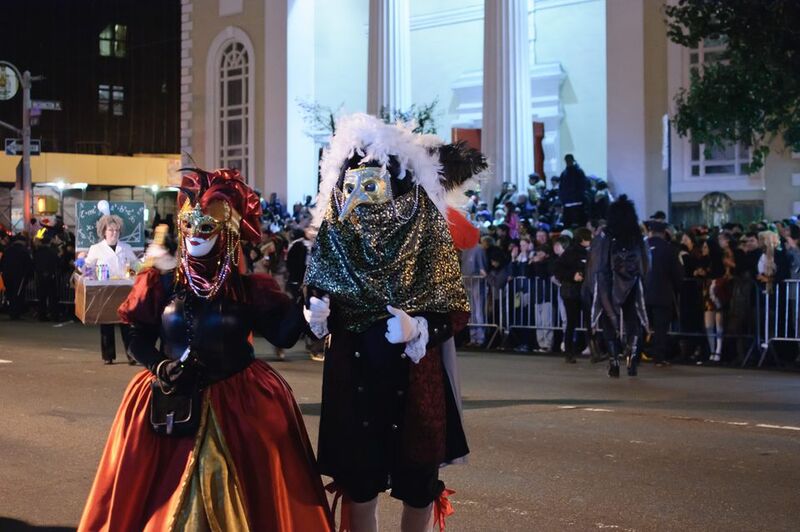 via Canal, East Broome or Sullivan Streets) to enter the parade between 6:30 and 9 p.m and you can join the fun, as long as you're wearing a costume! Only costumed parade participants will be allowed to participate, so be sure to dress to impress! You can travel only north along the parade route—the police will stop you if you try to go south along Sixth Avenue. Dress for the weather—the temperature can drop significantly once the sun goes down. Be prepared for crowds—this is a popular event, it's dark and it can be hard to keep your group together. Pick a meeting point and time in case you get separated. If you're taking kids to the parade, keep them close and be sure to have a plan if you get separated. It is dark and it's easy to lose someone among the crowd. Parade watchers start lining up 2 hours before the parade begins—with some persistence (& walking) you should be able to find a prime viewing spot up to an hour before the parade begins. This is a busy night for bars and restaurants along the parade route—if you're planning dinner after the parade, consider making reservations (especially if you're in a group). The parade is aired live on NY1 from 8:00–9:30 p.m., so if you're home waiting for trick-or-treaters you can still get a taste of the fun! The parade relies on donations to make it happen—show your support by ​making a donation (or even buying a tote!) on their website. Volunteers play many important roles in the parade—you can help build the puppets or even participate in the parade as a parade Marshal or a puppet animator!